David Simcock's Dream Ahead got up in the last stride to deny brilliant mare Goldikova in a thrilling Prix de la Foret at Longchamp. Goldikova was making her final appearance in France ahead of her planned bid for a fourth victory in the Breeders' Cup Mile, and all appeared to be going well as she took over from her pacemaker Flash Dance after the turn for home. But July Cup and Betfred Sprint Cup hero Dream Ahead came from out of the pack to challenge inside the final furlong and managed to gain a slender advantage in the very last stride, giving William Buick a second Group One success on the day after Elusive Kate. Outsider Surfrider finished third, with Irish raider Bewitched seemingly failing to stay after following Goldikova through in eyecatching fashion. The William Haggas-trained Dever Dream broke down in the straight. Buick said: "David has trained this horse to perfection, it's not been easy the whole way through. There's no point saying David's a good trainer because everybody knows that already. "Everything panned out today. I just wish Goldikova wasn't second because I'm a big fan, but Dream Ahead was a worthy winner, the best horse won the race. "I always said he'd be better in a good race because when he gets to the front he does nothing. Today he went a head up and started hanging left." Winning owner Khalifa Dasmal, who won the Derby with Shaamit in 1996, said: "To beat a horse like Goldikova is unbelievable and we'd have been happy to have finished second. He's a very good horse and he's proved it over several distances and on different types of ground. "I've sold part of him to Ballylinch Stud. I know it's a shame to retire him, but what would he do next year apart from winning the same races that he's already won." 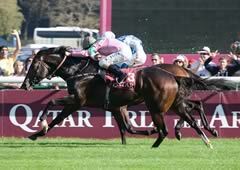 Head said of Goldikova: "I think the mileage is starting to catch up with her maybe, we will have to see. It's always disappointing to be beaten, especially with Goldikova. We may not have been fresh enough. She still has the Breeders' Cup to look forward and after that, it will be time."